You can use this Spread when you need to make some changes in your life. This can be personal changes, work or career changes, relationship or friendship changes. You can do a Separate Spread for each area of your life if you like. Shuffle as normal a Clear Deck of Cards. For the ‘What is Worth Keeping?’ do not Reverse any Cards. For ‘What is Worth Letting Go Of?’ Reverse The Whole Deck first. For ‘How Will I Grow as A Result?’ Shuffle the Deck with Cards Upright. If you wish you can Draw more than One Card for Clarification. Question – What is worth keeping and what is worth letting go of ? How Will I Grow As a Result? Worth Keeping? Worth Letting Go Of? What is worth keeping is your dedication and commitment to working hard for whatever it is you want. To be the very best you can be and to keep sight of your Goals and Long-Term Plans. Know that you are good at what you do and to aim high. What is worth letting go of is your doom and gloom attitude. The belief that nothing ever works out for you and that you have no luck in life. Success is what happens to other people and not you. The belief that for all your hard work and effort, there will be no positive result. How you will grow as a result of working hard and having a positive and optimistic outlook will result in you being able to achieve anything you want. So you must let go of your lack of self-belief and pessimistic outlook with regards to your ability to draw success to yourself. Understand that if you work hard for what you want, are dedicated and committed you can climb very high. Believe too that along with hard work and determination, you will create your own luck. It is a case of making things happen for yourself. You may never be lucky enough to win the lotto but there is nothing to stop you being lucky in other areas of your life. Guard your thoughts for what you dwell on most will be drawn to you. Believe you are luckless and so you shall be. 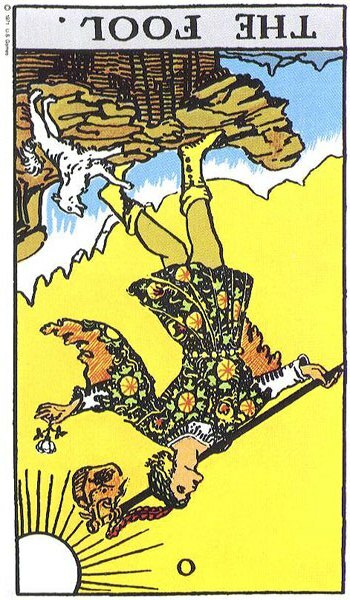 The Magician is the Ultimate Prize if you can let go of this negative attitude. This Spread is for those who find themselves at a Cross Roads in their life and are not sure which Direction to take. For this Spread you must choose a Central Card as to represent the place you are at present. This is the place you have arrived at, standing in the middle of the Cross Roads with your issues, situation or life. 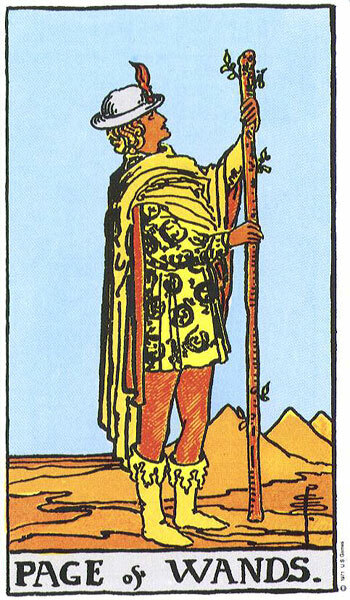 Then you must choose 2/4 Cards which reflect the Paths or Directions that you are aware of. These are the Directions you know you can go once you make up your mind. These Cards are not drawn blind, but are openly selected. These Cards should be laid in place around the Central Card in a manner that would suggest different paths you might take. These Cards are placed facing up. Now you must shuffle the remaining Deck asking the Question for each Path ‘what will the Outcome be if I take this Direction?’ and Draw Cards to place along the Path next to the Cards you have Openly Selected. These Cards remain face down for the moment. Now Shuffle the remaining Deck and ask The Question for each Pathway ‘what options or opportunities am I not yet aware of, other directions I might follow?’ . Draw a Card for each Pathway and place facing down. 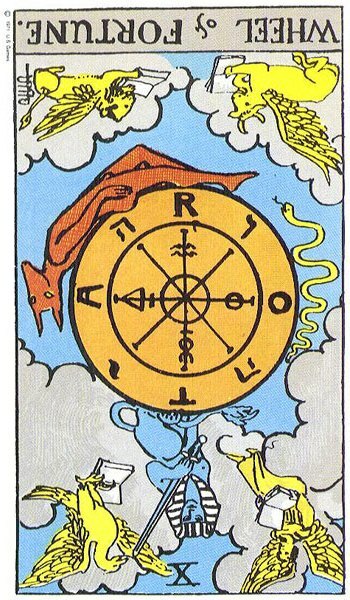 If you have originally only chosen Two Pathways or Directions, this time you must Draw Four to complete a typical Cross Roads, keeping the Central Card still in the centre. These may be Other Directions that will open to you in the future and should be taken into consideration. Sometimes we feel we have only a couple of Directions in which we can head. Now Shuffle once more asking the Question ‘what would the Outcome be if I choose these, as yet unknown Directions?‘ Draw a Card for each Pathway and place facing down. Now you are ready to start the Reading. Turn over the Outcome Cards for the Option/Pathway Cards you originally chose. These are the Options you are aware of. Analyse each Outcome and see if it matches your hopes and desires. Are there any surprises? Any disappointments? Now turn over the Cards you Drew for the Pathways/Options or Directions that are possible unknown to you or ones have never thought of. Analyse these Cards. Are there any surprises? Are there pathways options you would never consider or do they fascinate and draw you? Now turn over the Outcome Cards for the above new Pathways/Options/Directions. Analyse these carefully. Are there any surprises? Do any of the Outcome Cards look more beneficial or successful than the ones you drew for the Original Cards, the Pathways you were aware of? 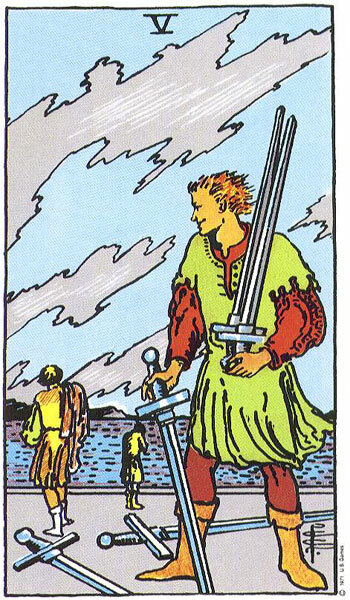 Has the Reading opened your mind to new possibilities or has it just re-confirmed what you originally thought? Has the Right Pathway or Direction being illuminated for you? 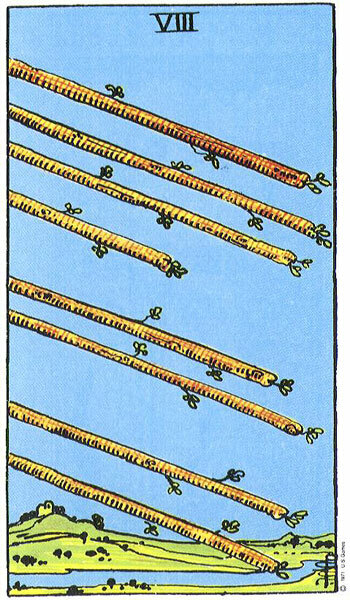 Central Card – Ten of Wands; A lot on my plate. Too much to do and trying to do it all on my own. 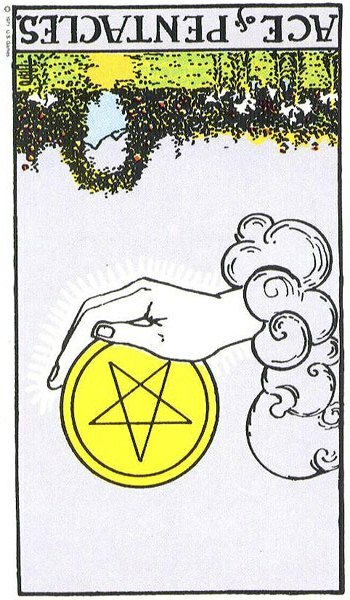 Option 1 – Seek the Help of a College Student Three of Pentacles. 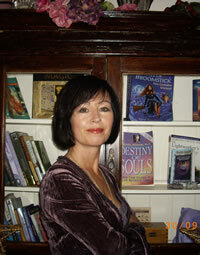 Outcome – High Energy, Enthusiastic young person who would be thrilled to get stuck in to project with me, Page of Wands. 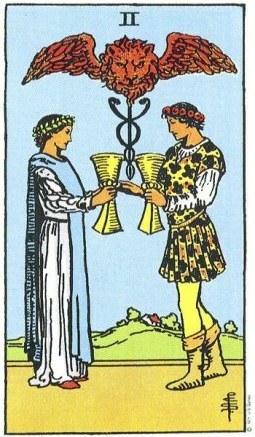 Option 2 – Look for a Partner to share the workload Two of Cups. Outcome – Power struggles and ongoing tension. 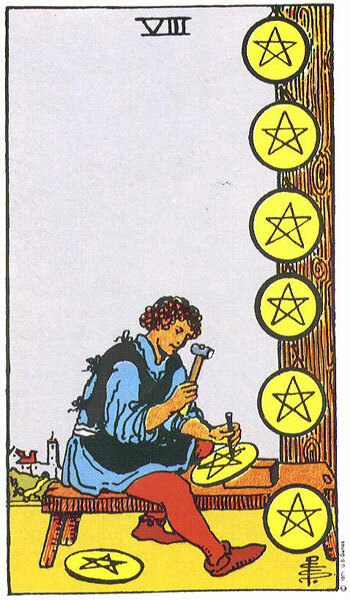 Option 3 – Keep my head down and keep working hard but alone, Eight of Pentacles. 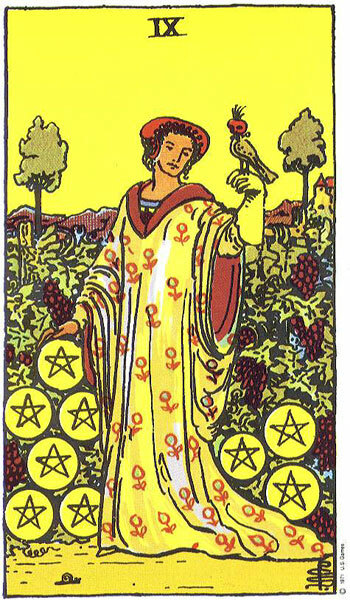 Outcome – Success and pride in achievement but will have made many sacrifices, Nine of Pentacles. Option 4 – Pay someone to do some of the work for me. 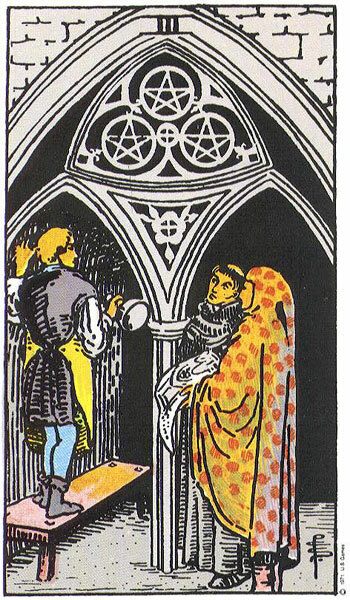 Delegate chores Six of Pentacles. Outcome – Costs prohibitive. 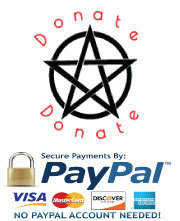 Not enough money to pay, Ace of Pentacles Reversed. Option 1 (a) – Just wait and hang on in there for the moment. Don’t try to rush things. 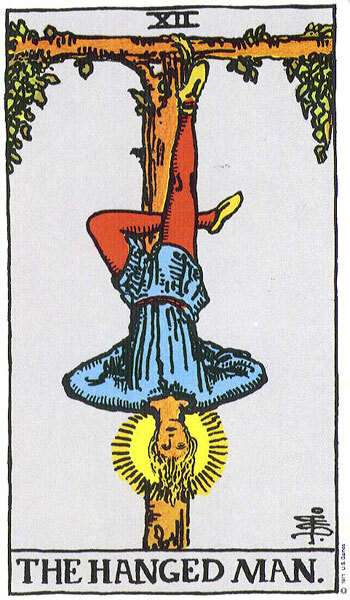 Everything comes to those who wait, Hanged Man. Outcome – Success, workable plan, everything in place and in order. Full personal control and total knowledge. Research and Self-Knowledge. Magician. 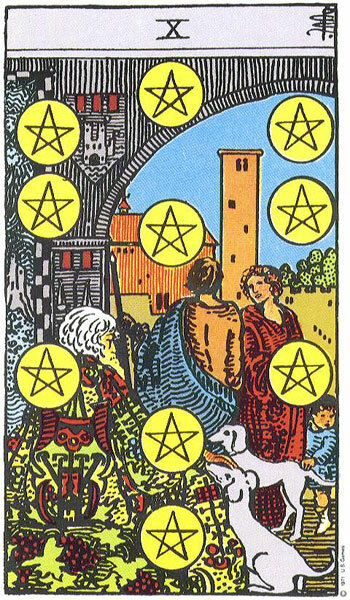 Option 2 (a) – Seek the help of family or look to the lending institution for investment Ten of Pentacles. Outcome – Maybe a foolish move. Too much of a risk. Not the right time, Fool Reversed. Option 3 (a) – Seek a Mentor, someone who knows what they are talking about. Someone who will take an interest in and share their knowledge with me. 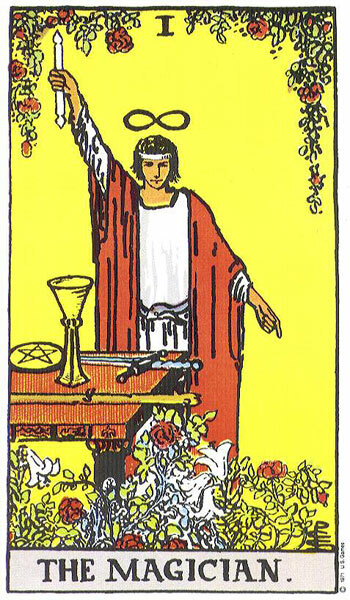 Good sound and solid advice, King of Pentacles. Things would really take off for me and I would be able to realise some of my Goals. 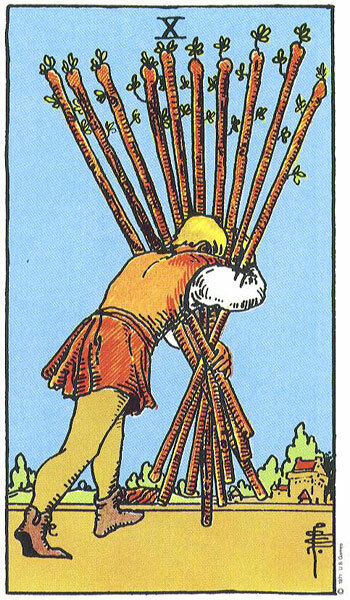 I would actually see things falling into place and my project, goals becoming a reality, Eight of Wands. Option 4 (a) – Similar to Option 3. Keep going and don’t change horses in midstream. Keep a forward momentum. 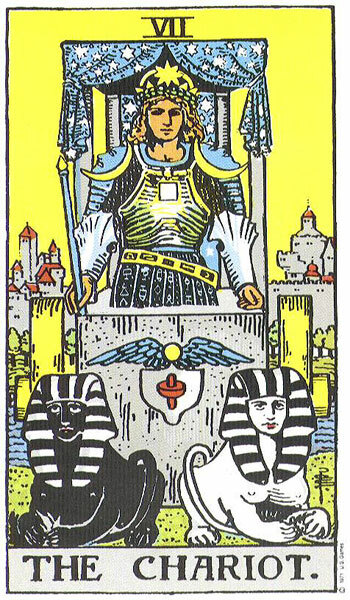 Tenacity and sheer discipline and willpower, The Chariot. Outcome – Success, acclaim and acknowledgement. 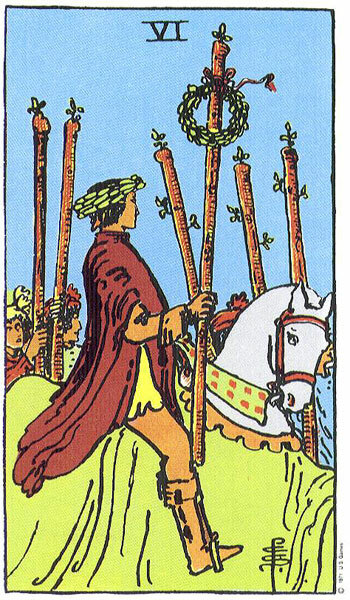 Many supporters and followers, Six of Wands. Summary – It looks like I need to pull together some of the more positive aspects from certain paths to create the right Direction for me to follow. It looks like that the best Direction is for me to keep going as I have been, and not to stop or give up as I am nearly there. All the hard work will be worth it. However, it wouldn’t be a bad idea to make sure I get things off to a good start by seeking the help of a Mentor who can guide and advice me on how best to do things. I also could benefit with seeking out a Young College Student who is eager and enthusiastic to help me in areas where he or she has more skills and knowledge, allowing me the time to do what I do best. Would also help them gain experience in their area of study. I must be patient though and not rush things. I have to wait until everything is in place with a workable plan so that I am assured of success. 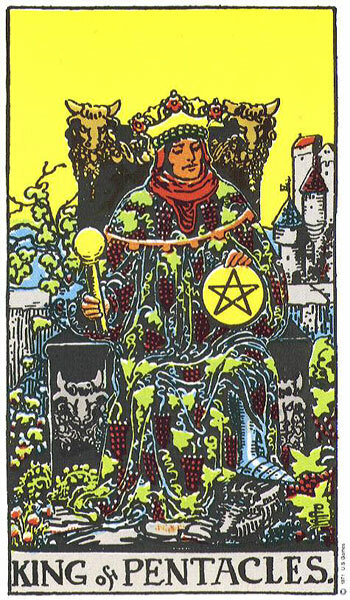 The King of Pentacles could help me with that. I should stay away from seeking investment or a partner at present as I have had full control for so long, it may be difficult to share that.Even with family or friends there may be conflict and power struggles.